Bob Franke took this photo of barred spiral galaxy Messier 109 from Focal Pointe Observatory in Chino Valley, Ariz., from March 13 to May 6 and released to SPACE.com July 10, 2013. 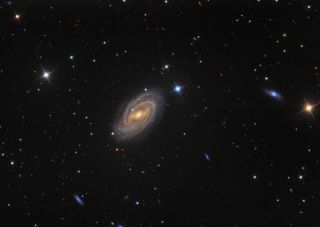 Astrophotographer Bob Franke captured this image of stunning barred spiral galaxy Messier 109 from Focal Pointe Observatory in Chino Valley, Ariz.
"The galaxy is visible in binoculars as a faint fuzzy patch," Franke wrote on his website, bf-astro.com. Franke used a 12.5" RCOS telescope at ~f/9 (2880 mm fl), 0.64 arcsec / pixel, a Paramount ME mount, SBIG STL-11000 with internal filter wheel, and AstroDon Gen II Filters to capture the image. The image was taken from March 13 to May 6 and released to SPACE.com July 10. You can see more of Bob Franke's astrophotography here.